The broad objective of this report is to analysis the financial activities of BRAC Bank Limited. This report based on the overall functions of financial department of BRAC Bank. Necessary data and information was collected mainly from the finance department as well as website of BRAC Bank. Finally identify the differences between the theoretical and practical knowledge by working directly in bank. To identify the financial activities of BRAC Bank Ltd.
To have some practical exposures that will be helpful in practical life. To identify the differences between the theoretical and practical knowledge by working directly in bank. This report is basically prepared on the basis of my practical experiences with BRAC Bank Ltd. For more clarification and better understanding, I have mainly collected secondary data from various sources. However, some primary data were also collected for gaining better insight into banks financial administration that have effects on the recommendation. Conversation with respective personnel of the bank. Practical exposures from different desks of various department of the organization. Annual report of BRAC Bank Ltd. Studying of different files, books, report, journal etc. Web site of BRAC Bank Ltd.
BRAC Bank Limited, with institutional shareholding by BRAC, International Finance Corporation (IFC) and Shorecap International, has been the fastest growing Bank in 2004 and 2005. The Bank operates under a “double bottom line” agenda where profit and social responsibility go hand in hand as it strives towards a poverty-free, enlightened Bangladesh. A fully operational Commercial Bank, BRAC Bank focuses on pursuing unexplored market niches in the Small and Medium Enterprise Business, which hitherto has remained largely untapped within the country. In the last five years of operation, the Bank has disbursed over BDT 1500 crore in loans to nearly 50,000 small and medium entrepreneurs. The management of the Bank believes that this sector of the economy can contribute the most to the rapid generation of employment in Bangladesh. Since inception in July 2001, the Bank’s footprint has grown to 22 branches, 350 SME unit offices and 19 ATM sites across the country, and the customer base has expanded to 200,000 deposit and 45,000 advance accounts through 2006. In the years ahead BRAC Bank expects to introduce many more services and products as well as add a wider network of SME unit offices, Retail Branches and ATMs across the country. BRAC Bank Limited, one of the latest generations of commercial banks, which started its journey on the 4th of July 2001 with a vision to be the absolute market leader. BRAC bank is a commercial scheduled bank extending full range of banking facilities as per the directives of Bangladesh bank. It intends to set standards as the absolute market leader by providing efficient, friendly and modern fully automated on-line service on a profitable basis. BRAC Bank in surviving in the large banking arena through its unique and competitive products and it is the only local bank providing 100% integrated on-line banking. The Bank is mainly owned by the largest NGO in Bangladesh – BRAC the Bank has positioned itself as a new generation Bank with a focus to meet diverse financial need a growing and developing economy. The Bank has embarked with an avowed policy to promote broad based participation in the Banish economy through the provision of high quality banking service based on latest information technology. The Bank will ensure this by increasing access to economic opportunities for all individuals and businesses in Bangladesh with a special focus on currently under served enterprises and households across the rural urban spectrum. We believe that increasing the ability’ of under served individuals and enterprises to build their asset base and access market opportunities will increase the economic well being for all Bangladeshis. Building a profitable and socially responsible financial institution focused on Markets and Business with growth potential, thereby assisting BRAC and stakeholders build a “just, enlightened, healthy, democratic and poverty free Bangladesh”. The Corporate Banking Division provides full range of commercial banking products and services. Other Departments such as Foreign Trade, Treasury, Credit Administration etc. plays the support role for a comprehensive range of service to the’ Corporate Banking Division. The Corporate Banking Division has a centralized structure through on-line banking system. Any credit facility is processed at the Corporate Banking Division, Head Office. After sanctioning of the facility, the limit is put online and the customer can enjoy the facility from any of the BRAC Bank branches. Credit approval process involves separate Credit Division, the Managing Director and finally the Board. Other Departments such as Foreign Trade, Treasury, and Credit Administration etc. plays the support role for a comprehensive range of service to the Corporate Banking Division. The Corporate Banking Group would try to serve the financial market of the country with the following objectives. To develop and sustain mutually beneficial customer relationships based on high quality service and innovative products. Maintaining a diverse and quality asset base and pursue a sustainable growth strategy. To pursue a management style that contributes to the well-being and development of a fully responsible and accountable workforce under a high corporate standard and business ethics. To provide and deliver services in a cost-effective manner. For security against the various facilities, we usually take cross-corporate guarantee and personal guarantee of the Directors of the private companies. In case sufficient collateral is not available, we create floating charge on present and future assets of the company with Registrar of Joint Stock Companies, equitable/registered mortgage etc. Most of the Bank In our country are operating locally basis. So most of their functions are concentrated on retail banking. BRAC Bank Limited is not exception of them. There is One Sales Center in Badda, which sells A/C of all branches. 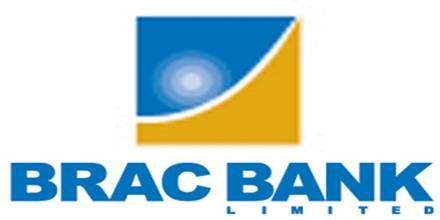 BRAC Bank has planned to open more Branches Within this year all over the country. There are more than 300 unit offices under SME division to support retail banking. Retail banking offers every facility except Corporate Transaction. Trade finance originally facilitates “International Business”. They handle L/C (Letter of Credit) and do necessary activities related to international trade. Check validity & authentication of trade license; import Registration Certificate, TIN Certificate, Vat Registration Certificated, and Insurance Cover Note. Received L/C LIMIT from Corporate. Signature Verification of Import on L/C App. Form & Performa Invoice check importer’s Signature on L/C AF & IMP form, available balance of Importer’s A/C. L/C Liability Create, Margin & Income realized From Importer’s Account. Entry to L/C ledger & register book. LC Proposal sent through SWIFT after proper authentication. Checking All Shipping Documents As Per LC Terms & Conditions. If the Documents are in order, Inions Customer to Take Delivery of Documents by paying the equivalent BDT of doc’s value. Fund Requisition To Treasury. Create PAD I L TR in The System & Complete P AD/L TR. L TR to be Created under Corporate approved limit. Payment instruction to the reimbursing bank as per negotiating Bank’s instruction. Adjust PAD by realizing PAD outstanding Amount item Importer’s A/C. Handover the original documents to the Importer with due endorsement by Authorize Signatory. Handle submission of “Bill of Entry”. Maintain Letter of Credit Report. Check The Copy Documents as per Terms & Conditions of L/C 100% Margin build up in equivalent BDT of documents value by debiting importer’s A/C. Check validity & authentication of Trade License, Export Registration certificate, and TIN certificate, VAT Registration Certificate & Insurance Cover Note. Trade Finance Check EXP certificate, C&F certificate Issue, NOC Certificate Issue, Intimate to Exporter After Receiving Remittance. Collect necessary documents from Exporter & Credit Export proceeds if documents found in order. They pass necessary voucher/ register Entry. Send Export documents for Collection to Foreign Bank (Bill Of Exchange, Invoice Packing List, Certificate: Of Origin, Bill Of Lading Or Airway Bill, GSP Certificate) with Bank Forwarding & document endorsement. Receives remittance credit proceeds to party A/C after realized necessary charges. Pass necessary voucher & Entry in Export register. Receive Guarantee proposal from Corporate Division with their approval. Create Guarantee liability. Check balance of client A/C. Realizing margin and other necessary charges. Entry guarantees register & ledger. Issue Bank Guarantee as per approval and signed by Authorized Signatory. This department of BRAC Bank Limited works widely over the country. There are more than 300 unit offices of SME division all over the country sell different type of loan to different small and medium enterprise. They provide loan, which are to be paid in installment. This department also monitors the recovery of the loan and in case of inconsistency they take necessary action to recover the loan. There are 3 products of SME. Anonno Loan: Under Anonno Loan one can get loan from 2 lac taka to 8 lac taka with installment. Apurbo Loan and: Loan one can get loan from 8 lac taka to 30 lac taka with installment. Pathshala Loan: This loan are given to those persons who want to establish educational institutions like; school, college, kindergarten etc. Interest rate varies for these loans according to their terms and condition. Finance department has the responsibility of doing budgetary planning and execution, cost management and ensure finance control across the Bank. It also generates and disseminates all forms of internal and external financial reporting. Marketing and Corporate Affairs is responsible for all forms of marketing and corporate communications, brand development, promotional activities, events, public relations and CSR activities. BRAC Bank envisages being the most preferred brand in its category. “Credit” department, through segmented approach, analyses and decides on Credit proposals submitted by business units. This unit formulates and updates a credit policy based on prevailing economy and industry behavior, sets assessment criteria, monitors portfolio health and suggest business units to review acquisition strategies. Credit also drives recovery tasks which is also critical to manage asset portfolio in a profitable manner. Technology is the fulcrum and staging ground for all BRAC Bank products and services deliveries. BRAC Bank IT manages the best-in-class technology platforms that proving the combustion fuel for aggressive business growth. BRAC Bank’s technology partners are some of the most renowned companies in the world. Asset Operation serves as a dual roles as the Bank’s last check point before a loan is given and as a catalyst for fast disbursement of loans across the country. It provides vital support for the SME, Retail and Corporate/Trade Finance lines of business. Consumer Service Delivery performs key centralized functions for branches such as account opening, ATM and credit card production, check book production, government bond processing, customer statement generation and cheque clearing. Channel Infrastructure Development is a specialized department dedicated to sourcing and development new branches, direct sales office and ATM location in the right places. General Infrastructure Services is a vast area that encompasses physical and outsourced support services, procurement, and logistics and premises maintenance. It is the executing point for all administration-related activities for BRAC Bank. Payment Services primarily serves as the main gateway for non resident Bangladesh remittances. It provides back office support to the Secure Division as well as handles Corporate Cash Management services. Treasury Operation and Financial Institutions Service has a dual role in running the treasury mid office and back office functions and ensuring fast and efficient movement of funds across BRAC Bank’s corresponding banking network within the country. PSRM Operations is a new concept combining traditional re-engineering ideas with more contemporary practice to create sustainable business processes that are well balanced in terms of efficient service delivery, optimum risk management and strong MIS. Custodian of the Overall Books of Accounts of the Bank. Financial statement showing the assets, liabilities and owners equity of an enterprise on a specific date. Financial statement showing revenues earned by a business, the expenses incurred in earning the revenues, and the resulting net income or net loss. Cash Flow Statement & financial statement showing inflow and outflow of cash & cash equivalents during a specific period classified by operating, investing and financing activities. A statement showing the assets & liabilities maturity Analysis. Formation, Country of incorporation and Status of the organization. Notes related to Balance sheet & Profit & Loss Account. Day to day other expenses of the bank. Division wise Monthly Financial Performance. Monthly Yield on Assets & cost of Deposit. SME Unit wise Monthly Financial performance. The paid up capital of the bank is being raised from Tk.500 million to Tk.1000 million in the year 2006 through initial public offering of shares held in 2006 at a premium of Tk.70 per share. The bank ended the year 2006 with a total shareholders’ equity of Tk.21117.19 million compared to Tk.782.93 million in the year 2005. The bank attained capital adequacy of 13.53% compared to the current regularity requirement of 9.0%. Total assets figure of Bank to Tk.20011.82 million in 2006 from Tk.16876.01 million in 2005 registering a growth rate of 77.84%. In the year 2006, the financial base of the Bank was further strengthened. Its total revenue in the year 2006 was Tk.2077.43 million against Tk.1173.32 million in 2005, an increase of 77.06%, while it achieved an operating profit of Tk.1050.41 million compared to Tk.580.32 million in the previous year, an increase of 81.01%. Net profit before tax for 2006 stood at Tk.705.36 million against Tk.340.36 million of 2005 registering an increase of 107.24%. Earning per share stood at Tk.63.31as on December 31st, 2006 compared to Tk.38.54 at the end of the previous year. Sorting out discrepant request branch wise and send back. Working in a fast growing bank, BRAC Bank Ltd. provides me a wide range of opportunity to observe different functions of bank through the cordial assistance of the employees and seniors. All the employees of the different departments usually used to give the optimum service to their customer though they have some limitations. If these limitations turn positively by the management the branch may attain the ultimate goal. The banking sector of Bangladesh is passing through a tremendous reform under the economic deregulation and opening up the economy. Currently this sector is becoming extremely competitive with the arrival of multinational banks as well as emerging and technological infrastructure, effective foreign trade management, higher performance level and utmost customer satisfaction. The growing competition bound BRAC Bank Ltd. not only to competition with the other commercial bank but also with the public banks. For the future planning and the successful operation in achieving its prime goal in this current competitive market this can be helpful in international trade financing that suggested mostly for the betterment of country. During the three months internship program in BRAC Bank Ltd. almost the entire desk has been observed more or less. In fact, it has been arranged for gaining knowledge of practical banking to compare this practical knowledge with theoretical knowledge. Working experiences in BRAC Bank Ltd. are quite well as I have no opportunity to compare with other organizations. But sometimes there created some problems while working in the new environment, then I took help from the senior employees and they helped me as an employee. It should assign necessary manpower for its financial and operation sector. The decision making process especially in the finance department should be more fast. A vigorous and comprehensive orientation and training program should be launched to enhance the employees’ skills because they fail to inform the customer about the current situation. BRAC Bank should improve their communication process between head office and branches quickly. BRAC Bank could increase its efficiency and reduce time cost by setting proper planning for each and every function as well as for the whole department.